Agni and Luna are siblings who live in a frozen Earth cursed by “the Ice Witch.” The siblings are also among those known as “The Blessed,” people born with abilities to perform miracles. Not all of “The Blessed” are friendly. Some are murderers, like the man called “Doma.” He is blessed with the power of fire, which he uses to destroy Agni and Luna's village and to kill Luna. Doma engulfs Agni, who has regenerative powers, in a flame that will never extinguish. Now, Agni is a walking man of flame, seeking revenge. Fire Punch, Vol. 2 (Chapters 9 to 18) finds soldiers and Blessings in service of the city of Behemdorg still trying to destroy Agni. They have beheaded him and plan to dump his flaming head in the ocean before Agni's power of regeneration grows him a new body. Enter the mysterious girl, Togata. She loves American movies from the distant past, and now, this movie buff wants Agni and his quest for revenge to be the stars of her new film. 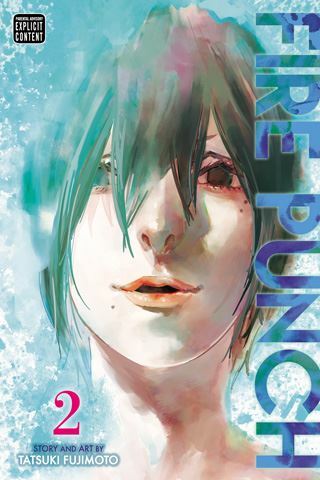 I READS YOU RECOMMENDS: Readers looking for dystopian science fiction manga will want to to try VIZ Signature's Fire Punch.